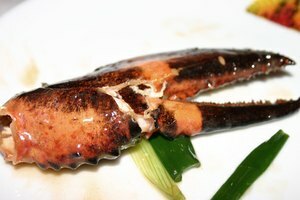 Lobster is a true delicacy, and cooking your own at home is a great way to enjoy it at a more affordable price. However, dealing with live lobster is a pretty big challenge for novice cooks. 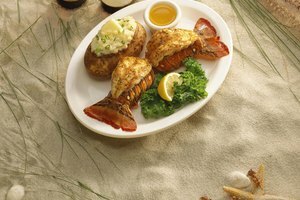 It's much simpler to buy lobster meat frozen, but you'll need to know the best ways to get from rock-hard to thawed, tender and ready-to-cook lobster without the risk of bacterial growth, excessive shrinkage or dry meat. The most tried and true method for defrosting meat of any kind is by slow refrigeration. 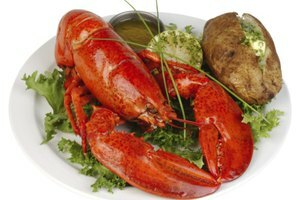 The length of time the lobster needs to defrost in the fridge depends on the amount. To defrost over one pound of lobster, you should let it sit in the fridge overnight. If it's under one pound, you could stash it in the refrigerator in the morning, and it should thaw by dinner time. Running water over frozen lobster meat is a faster way to defrost. Seal the lobster in a plastic bag, place it in colander under the faucet, and run the water. 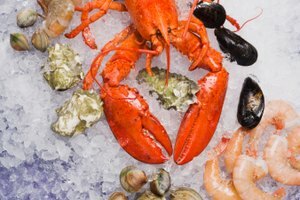 Seafood is extremely prone to bacterial growth, so never use warm or hot water—only run a continuous stream of cold water. Keep an eye on the package and shift or rotate it so that the water evenly distributes over the frozen surface area. This method takes time and patience, but it's a wonderful way to preserve the freshness of the lobster while helping to prevent sudden shrinkage from heat. Thawing frozen lobster meat in a microwave oven is fast and easy. Most modern microwaves have a defrost setting and many even have programmable features so that you can set the type and weight of meat you're thawing. If you don't have a defrost setting, simply set the microwave to low heat, place the lobster on a plate in the microwave, and hit start. Make sure to rotate the meat every 30 seconds to 1 minute to ensure even heating, and check frequently to prevent premature cooking. If you use this method, be sure to cook the meat immediately after thawing since these warm conditions create a breeding ground for bacteria. If you're extremely pressed for time, it's possible to flash thaw seafood. Just keep in mind that this method's fast addition of heat may shrink the lobster meat. Place the frozen meat directly into a shallow pan, and add a little water and oil or butter. Place a lid on the pan and crank up the heat. Check the lobster for tenderness and cook it immediately.